Below are some tips to help you eat from your garden throughout the year. I am going to show you how to extend the season and grow food even when the temperatures begin to drop. As the summer growing season comes to an end, gardeners are left to wonder how they may be able to continue harvesting fresh food. There is no reason to think that winter yields are impossible. In fact, with careful planning and some luck from the weather, growers can enjoy their garden throughout the entire year. Below are some tips to extend the growing season and continue eating locally. Root vegetables, such as carrots and beets, are able to improve with the exposure to chilly temperatures. This means you can leave them in the ground until you are ready to harvest. This means you can harvest them even when there is a small amount of snow. For the best texture, harvest the produce before a deep freeze. When the temperatures are cold, you will want to wait until midday to harvest so the ground is at is highest temperature. When you dig in frozen soil you can create compaction and disturb soil tilth. Waiting until the warmth of the afternoon means less damage to the soil. Perennials such as rosemary and lavender thrive if they are potted and moved indoors for the winter. They can tolerate some cold so you can keep them on an unheated porch if you want. Water the soil sparingly and mist the leaves. You can transplant the perennials back outside in the spring or move the containers back to your porch. Lightweight mulches such as straw offer plant leaves and roots protection from the cold and wind. Deep mulching is applying several layers of mulch material. This is effective for cold-hardy, dense vegetables, like cabbages, turnips, beets, etc. Mark the ends of rows and cover them with 6 to 12 inches of straw. When you want to harvest, dig through the straw, pick a vegetable and replace the mulch. This technique has been proven to be effective with zone 6 farmers in Ohio in order to harvest cabbages in February. Row covers are layers of fabric or plastic over small metal or plastic hoops. They increase the air and soil temperatures around your garden by trapping solar heat. The warm bubble under cover allows kale, chard and cold-tolerant lettuces to continue growing while protecting roots from freezing. Your row cover should be designed so that it can be easily removed. This will help when it comes time to ventilate heat or collect food. Make sure you choose materials that are rated to provide the temperature you need. Lightweight fabric is excellent for protecting greens from an early frost. My farm uses a layer of perforated plastic covered by mid-weight fabric to protect our fall carrot crop for harvests well past Christmas. The heatable air space is fairly small so the rows can get warm too quickly and burn the leaves of lettuce. Make sure you keep an eye on the outdoor temperature and figure on a sunny day, rows under clear cover will be as much as 40 degrees higher than the surrounding area. A lot of fruits and vegetables can be stored under the right conditions for months. This is the ultimate way to extend your harvest. It is very common for farmhouses to include a root cellar for this purpose. Modern homes often have spaces that can mimic the same conditions. To build an outdoor root cellar you need to dig into the side of a hill or directly in the ground. Excavate a space and top it with an old door or sheet of wood to keep the precipitation and wind away. You can also build a cold-storage area in your basement or spare room if there is not enough land pace to do so outside. Squash, potatoes, carrots, and apples all need similar circumstances to store: cool temperatures, high humidity, darkness, and ventilation. A basement room with an earthen floor is the ideal space. Barring that, pack vegetables in slightly dampened sawdust or paper in a wooden crate and store in the darkest spot you have. Vegetables should be stored in crates or baskets in order to all aeration and have a plan for heavy rains. If the cellar fills with water, your produce may be ruined. Vegetables should be left unwashed. Winter squash, however, can benefit from being wiped with a rag soaked in white vinegar to kill fungus or mold spores that frequently linger on the surface. With whatever option you choose, remember it is important to check in your food often. Remove any rotting pieces in order to prevent the spread of mold and fungus. f you have a see- starting setup and some extra seeds, consider growing microgreens or lettuces during the winter. Kale, broccoli and radish can all be grown as microgreens when seeded densely on a thin layer of soil. Sow lettuces in deeper trays for cut and come again convenience. Many young greens can be cut after as few as two weeks, so you can easily supplement your family’s salads for the months between late fall and when you begin starting seeds in the spring. If your crops are already dug up or you don’t have the option of investing in root cellaring, row covers or lights right now, stay warm by planning for next year. Include space for an extended fall harvest in your garden sketches. Add cold-hardy seeds to your wish list. Plan successions of roots and greens, start amassing mulching materials or save up for a hoop house to increase your winter growing potential. The cooler seasons don’t have to leave gardeners wringing their hands indoors. 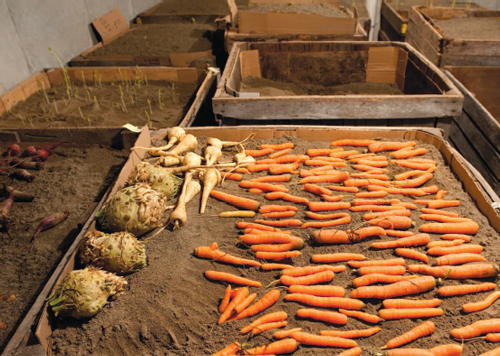 Experiment with winter growing and you’ll be surprised at the abundance that’s possible.